Dentists typically recommend brushing at least twice per day and flossing at least once per day. But is it possible that you could actually “overbrush” your teeth? It may come as a surprise that the answer is “yes”. In fact, overbrushing can lead to a condition known as toothbrush abrasion. This often results in sensitive teeth and receding gums. 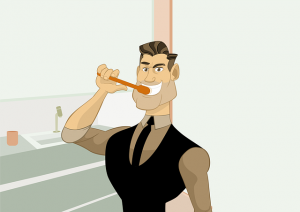 Brushing too much can put excess wear and tear on the teeth and cause premature wearing of tooth enamel. This can lead to tooth sensitivity. What’s more is that brushing too much can push back the gums, potentially revealing the more sensitive root part of the teeth. Gum recession is another potential problem and is often associated with periodontal disease and the possibility of cavities on the exposed root parts of the teeth. In order to avoid toothbrush abrasion from overbrushing, it’s critical not just to brush per your dentist’s recommendation, but also to brush correctly. For instance, avoid those hard-bristled toothbrushes, as they’re tougher on the teeth and don’t scrub hard when you brush. Instead, focus on gently brushing your teeth for 2-3 minutes, moving the toothbrush around at different angles to reach all areas. When it comes to brushing, taking your time and being thorough is more important than brushing hard. Use mouthwash: Mouthwash not only leaves your mouth feeling clean and fresh but also removes bacteria. Brushing the tongue: Brushing the tongue can remove bacteria and plaque buildup to help lead to a cleaner mouth. Chew gum: We recommend going with a sugar-free type of gum to help avoid dry mouth. Chewing gum can also help dislodge food that’s been caught in the teeth. And don’t forget to make your regular appointments with your dental professionals at Longmeadow Family Dental Care.